Did you know that March 23 was National Eucalyptus Day? I only just discovered this while looking through the CSIRO children’s pages for holiday activities. When I looked back at the newspapers for the 23rd there was no reference to it, though the ABC did mention it on Australia Day on the 26th of January. There’s scarcely been a film about Australia that doesn’t feature a gum tree or two and they also provide the hazy blue or olive -green backdrop to our lives. We take them for granted because of their ubiquity and seldom stop to consider how amazing and diverse they are. 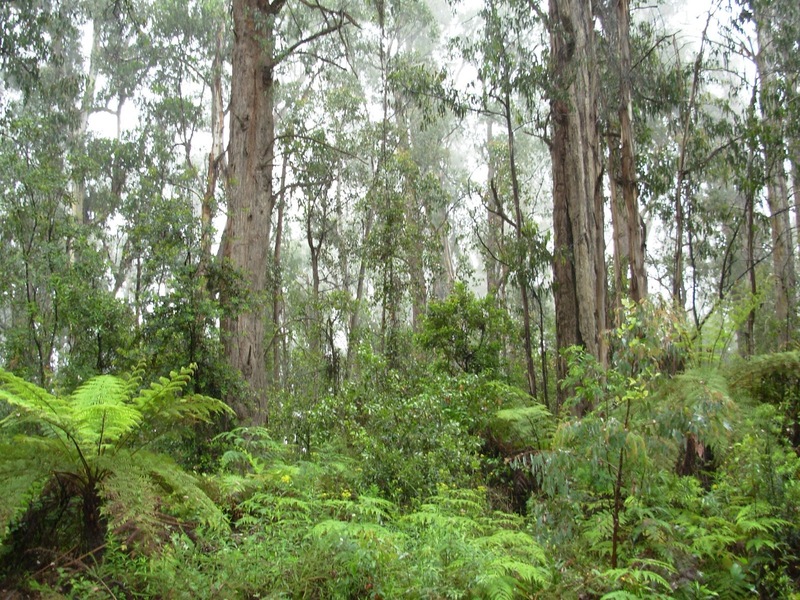 They cover three quarters of Australia’s forest and woodland and have adapted to almost every niche apart from the deserts, from the tropics to the southernmost parts of Tasmania, from sea level to approximately 1300m. They are not very frost tolerant but can endure poor soils and long periods with minimal rainfall. There are 900 known species of which all but six are native to Australia, though they have now been widely planted in many other countries, especially in drier parts of the world such as South Africa, China, India, North and South America and parts of the Mediterranean. 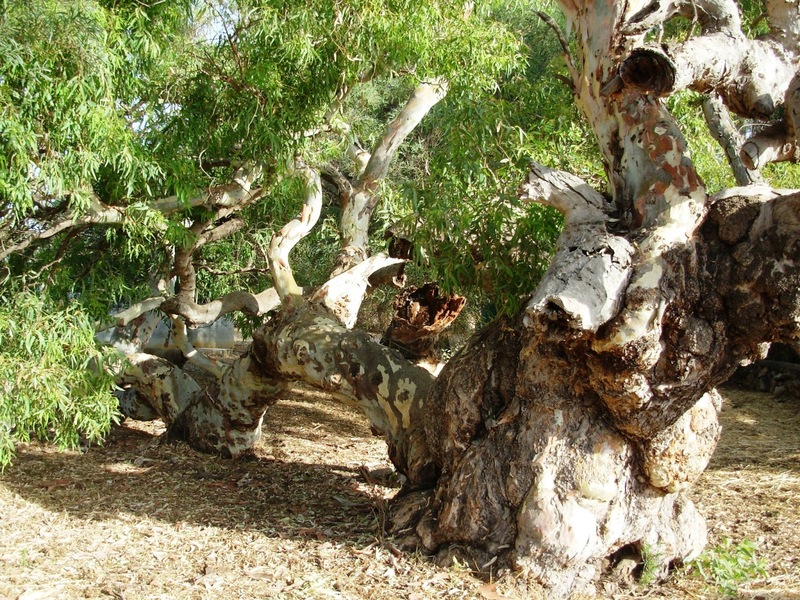 I saw more Tasmanian Blue Gum in Chile, than I have seen in Tasmanian forests and it was a beautiful spreading gumtree in Morocco which made me homesick for Australia, after travelling around Europe all those years ago. Eucalypts are now the most common hardwood for building. 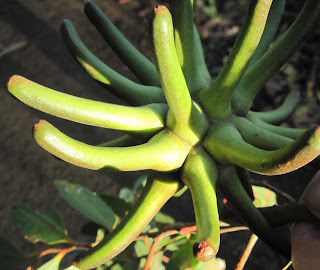 They are used for making pulp and paper, or as a fast growing source of firewood. Their oil too has many uses, including making cleansers and disinfectants and for medicinal purposes. Who hasn’t stuck their head under a towel with a steaming bowl of water to which a few drops of eucalyptus oil have been added, when they feel a cold coming on or to clear their sinuses? 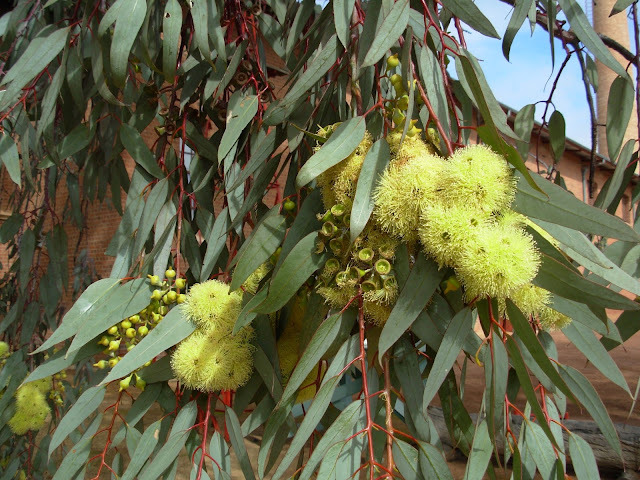 Ironically, China now produces more eucalyptus oil than Australia does and supplies the bulk of the world’s market. As well as being an attractive ornamental, they also provide a whole range of eco system services such as habitat and shade for other species, lowering water tables and of course, sequestering carbon. Eucalypts have also been used to drain swamps to prevent malaria in places such as Lebanon, Southern Italy and the Caucasus. However, Like all good things, they do have a couple of drawbacks –namely their tendency to burn too well because of their high oil content, as people in California, Spain and of course Australia have discovered to their cost. They also consume a lot of water - hence their ability to lower water tables and reduce salinity, and they also have a bad habit of dropping tree limbs which do not necessarily endear them to their beneficiaries. 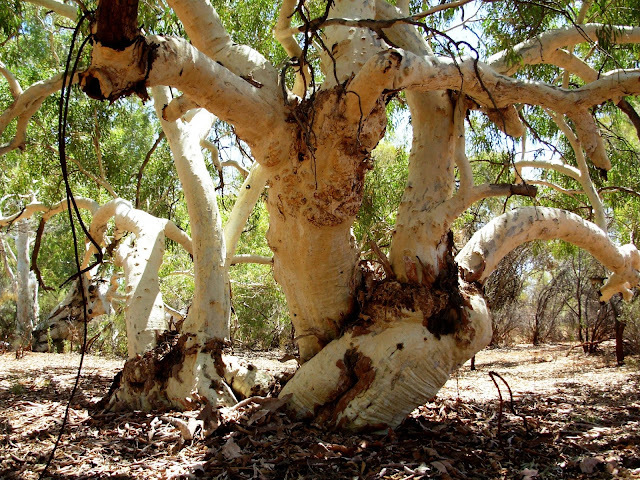 One of the truly remarkable things about eucalypts is their ability to recover after a fire. If the fire isn’t too hot, most are able are able to regenerate by growing new shoots. 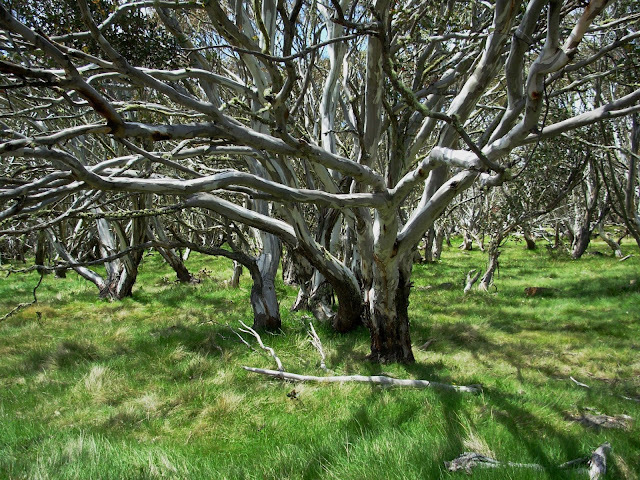 Only the Mountain Ash and the Blue Gum need to grow from seed, but these also need fire to make the seed viable. 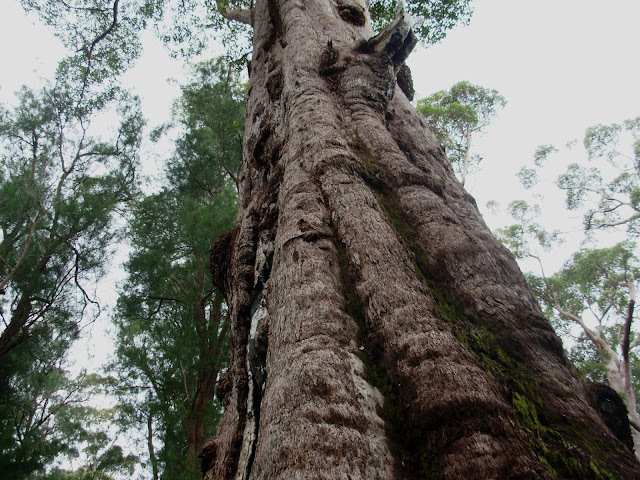 These two trees are among the tallest trees - certainly the tallest hardwoods and flowering plants in the world, with Centurion in the Hartz Mountains at 99.6 metres, being the tallest of them all. They are also a very ancient species. The oldest fossil found in Patagonia is around 52 million years old, but genome sequencing shows that they have been around since Gondwana times over 100 million years ago. Although they are great survivors, around 7% are endangered. For this reason, especially as climate change begins to bite, we are urged to plant those species such as Mongarlowe Mallee in gardens to increase their chances of survival. The birds and bees will thank you too. Ask your nursery about species which suit your region and will not grow so tall as to be a nuisance or a danger. I'll apologise in advance for any mislabelled species. Not only do Eucalypts have large numbers of subspecies which find different expression in different places and are called by many different names by locals - the name "Tasmanian Oak" for example, is applied to three different species and a Stringy Bark can be anything with ragged looking bark, but in some cases, only a scientist with a microscope can tell for sure. If you would like to know more try the CSIRO's Euclid pages. 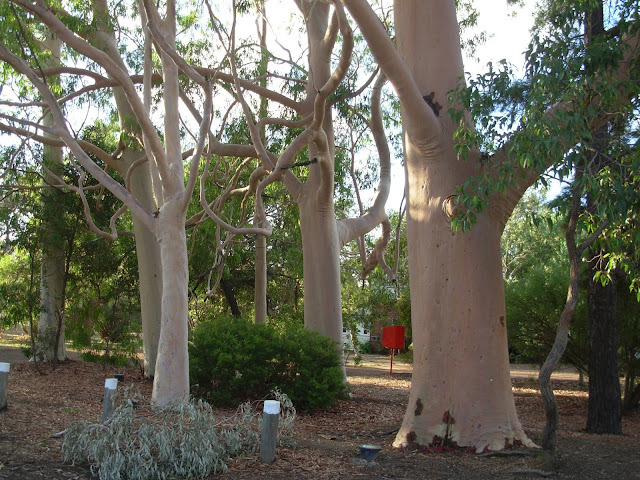 I would love to have included many more pictures and don't have any tropical ones, but I'm sure you get the idea that Eucalypts - (not all of them are gum trees) are very interesting and diverse and yes, we should appreciate them much more.